Burbank, CA – Although Asian forms of martial arts took its first step into Western civilization over 150 plus years ago, this is the first time an official book has been released recognizing the martial arts' most significant pioneers, champions, founders and more. 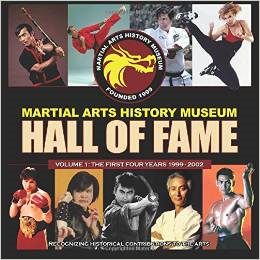 Entitled “The Martial Arts History Museum's Hall of Fame,” this is the first book ever to hit the market depicting its most revered pioneers. Created by the Martial Arts History Museum, this book formally enlightens the non-martial arts public to the impact Asian forms of martial arts have had on American society. Similar to the Baseball Hall of Fame, the Martial Arts Hall of Fame bestows a professional and unique look at the martial arts industry as a whole. It opens the doors a world that is followed by millions upon millions of practitioners across the globe, all of which have been connected in some part to the Museum's pioneers. The Martial Arts History Museum is located at 2319 W. Magnolia Blvd., Burbank, CA 91506. Mamuseum.com. The Museum is a Non-Profit 501(c)(3) organization and is operating completely by donations and memberships.